We are excited to announce that starting today a limited batch of 50 Arduino TRE Developer Edition boards is available in the Arduino Store. The Arduino TRE Developer Edition (see other pics) is a pre-production board. Its release kicks off our redesigned Beta Testing Program: anyone in the community who purchases the board will be able to give us feedback and suggestions in a new, direct way. After buying the board you’ll receive an invitation to join the beta-testing program, as a beta-tester you will be able to contribute to the development of the board by signing up for tasks and projects. You’ll be working alongside the Arduino and BeagleBoard.org teams on tasks such as writing examples, testing libraries and external hardware, and making projects. Completed tasks will be rewarded with a special program of benefits, including the possibility of featuring your project on the Arduino blog and receiving a coupon for the same value of the TRE Developer Edition you purchased. We will be beta-testing the board for about three months. 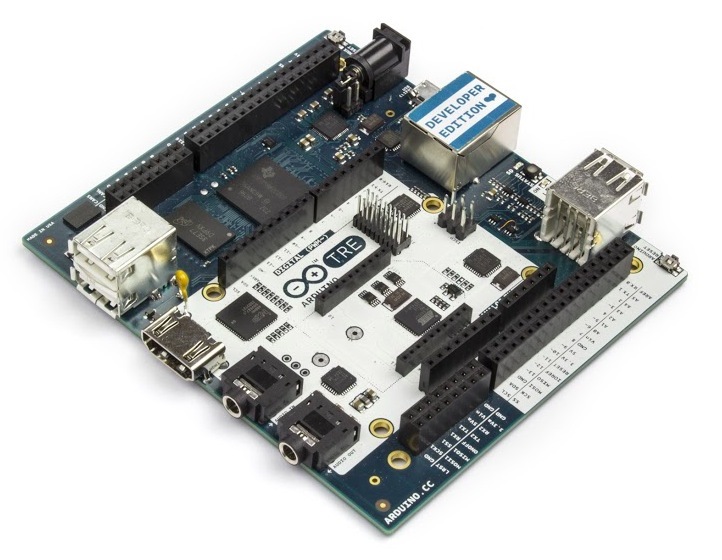 As many of you already know, the Arduino TRE is not a typical Arduino board. It’s a Linux computer running on a Sitara processor, plus a full Arduino Leonardo. It builds upon the experience of both Arduino and BeagleBoard.org, combining the strengths of both. When using Arduino TRE you’ll see a new editor (IDE) that has been specifically developed for this board. 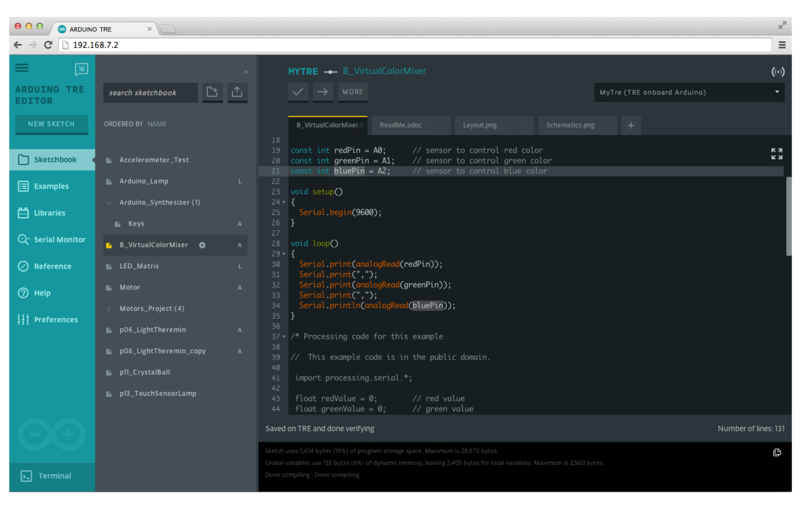 The TRE IDE comes pre-installed with the onboard Linux and is accessible via a web browser. 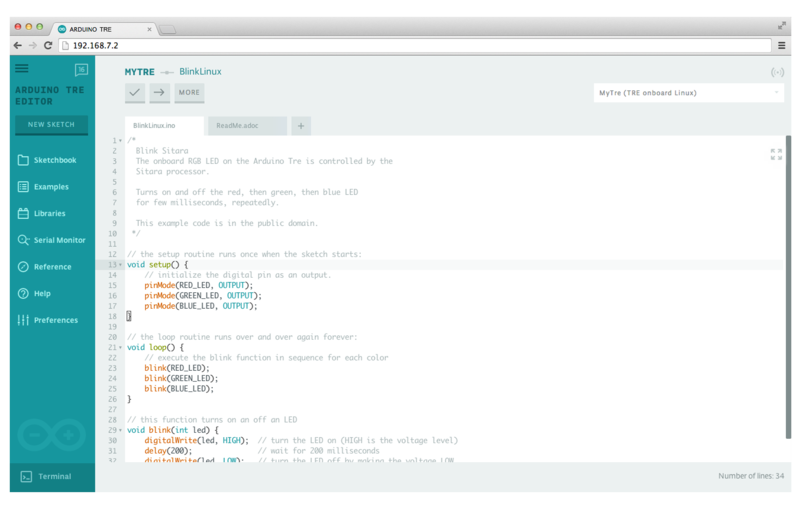 It builds upon the simplicity of the Arduino software experience, while adding a few new powerful features (such as uploading sketches from the onboard Linux) and a refreshed UI. Please keep in mind that the final release could differ to any degree from this one. By being part of the beta program you will be notified in realtime of any change in the hardware or software so that your product or application will be fully compatible with the release version. The Arduino TRE final board will be available later this year, pending results of Beta Testing Program. Arduino TRE Developer edition will be also at Maker Faire Bay Area next weekend! Come and visit us at the Arduino booth (#204). We’d love to have one at our facility for our students to explore. It would be great,if i get one for my start-up research purpose. I *REALLY* hope that price comes down once the board is in production. The whole robot kit barely costs more. I’m interested in the board, but not at that price, not even remotely. Ordered. Can’t wait to get involved. Been playing with the Yun but for some things it is, unfortunately, a little limited on the Linino side. I was eating my PI, but I can’t wait for this puppy. when will it be finally available? it’s almost 2 years since announce!